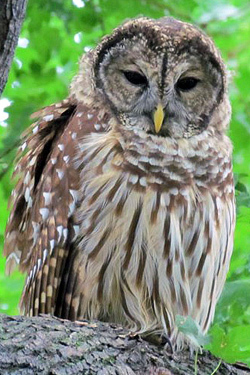 Bundle up and join Shaw Nature Reserve and self-taught ornithologist Brenda Hente for a hike through our tallgrass prairie and woodland to learn about Missouri's native owl species. The sun will start to set as we begin. This time of day is prime for hearing owls. Learn how we have restored owl habitat here, how owls are designed for survival such as physical and behavioral adaptations including their eyes, eyelids, ears, silent flight, talons, tendons, feathers, facial disc, social-life, habitat, and courting behaviors that have worked together to make owls the most recognizable nocturnal birds. Explore the science behind these adaptations as we learn about these popular raptors' awesome anatomy and mysterious behaviors. Hike is approximately 2 miles on hilly terrain. Designed for adults only. Registration ends January 21 at 9 a.m. Remember to dress for the weather. Layers are best in winter. Hiking stick and flashlight optional. Follow the signs to the Trail House at Shaw Nature Reserve. Come prepared for a 2 miles hike on hilly terrain.